This loyal customer, (this is our third house together! 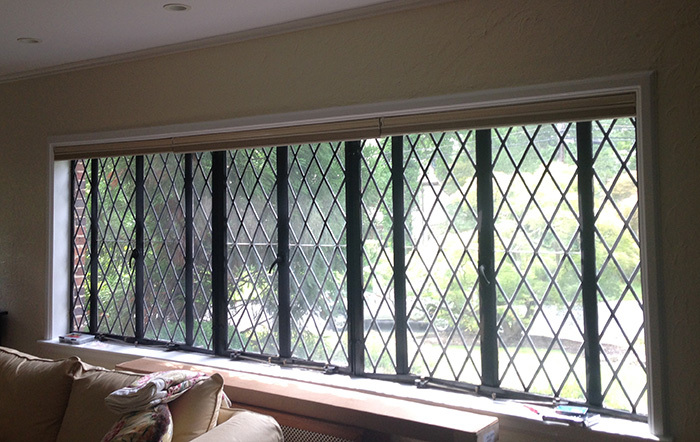 🙂 ), wanted a traditional window treatment for the living room of their stately, Tudor style home. 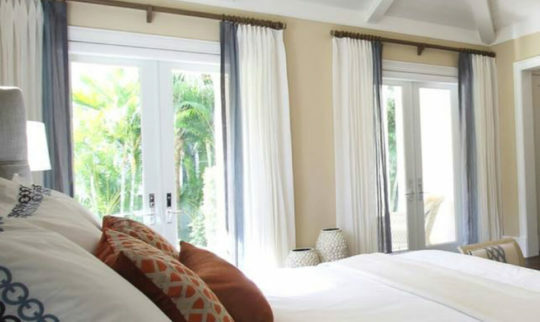 It was obvious that her large, south-facing window would translate in to hot sun all day, and needed layered window treatments. First, we installed a Hunter Douglas Duette Architella honeycomb shade inside mount across the entire window. 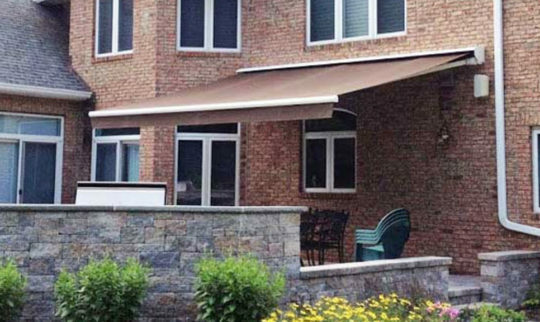 The cellular shade, made of 4 layers of fabric in honeycomb construction, is meant to be down all day while their busy family is at work and school. It provides unparalleled UV protection for their furniture, wood floors and area rug, as well as significant energy insulation both summer and winter. 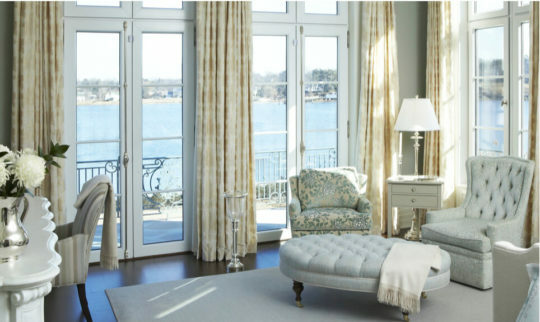 When they are home, the pleated shade pulls completely up under the valance, showing off the delightful leaded glass feature of the picture window as well as the view beyond the window. Next came this fabulous floral, Hatfield Multi, from Stout Textiles. Actually, once we had it narrowed to 2 floral fabrics, the husband picked this one and boy was he right! The bright yellows, reds and blues, the floral pattern, everything about it perfectly conveys the sunny, happy feeling of this family and their lifestyle. After nailing down the fabric we turned to designing the window treatments for the 2 very different types of windows in the room. The decision to lavish full focus on the picture window was a no brainer. A tailored kick pleat valance with stationary drapery panels to frame the window accomplishes this nicely. And, for the smaller side windows flanking the fireplace, flat roman shades are the perfect compliment. The roman shades bring the color and pattern around the room without overwhelming the small windows or crowding the fireplace. Of course, designing and installing a gorgeous window treatment always makes us smile but it pales in comparison to this email we received!!! The drapes and valances look spectacular!!! Just as I hoped for and a beautiful new look and feel to the rooms and hallways. 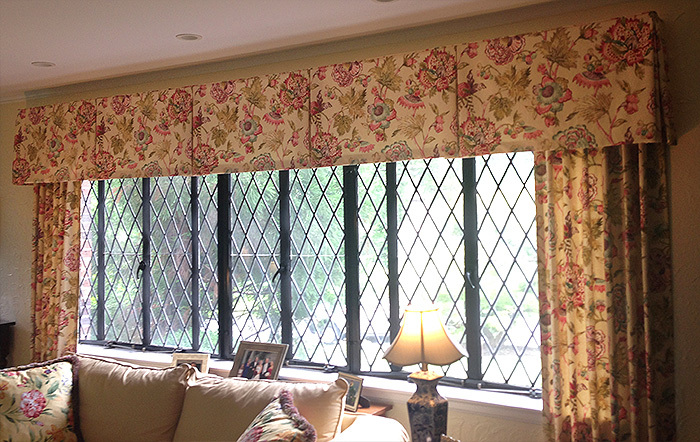 Bonus Insider Window Treatment Tip – We used 95% black out lining along with interlining so the floral pattern and colors weren’t distorted by the sunlight. 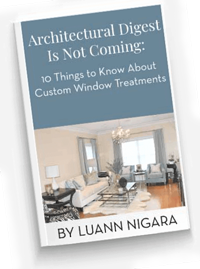 Learn more about window treatments here.